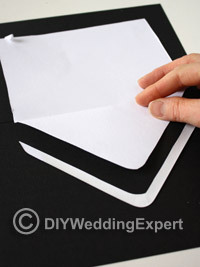 Lining your wedding invitation envelopes is a beautiful way to present your invitations. 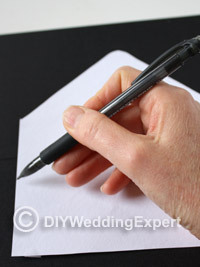 You can coordinate them perfectly with your DIY wedding invitations by using the same colored paper that you have used on the invite. One of your chosen envelopes. 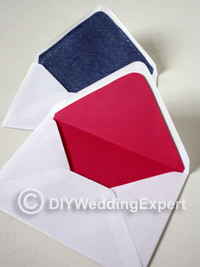 Colored paper that coordinates with your invitation. 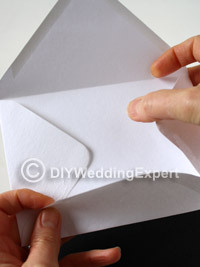 Take one of your envelopes apart, taking care not to rip it! 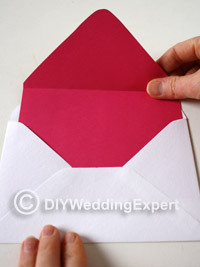 Cut off the sides and carefully cut around the layer of glue that seals the envelope. Place it on your scrap card and draw round it. Cut it out and now you have a template that you can draw around. 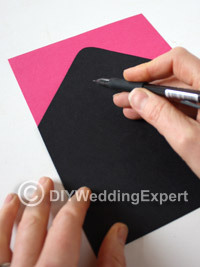 Place the template onto your chosen coloured paper and draw around it. Cut it out. 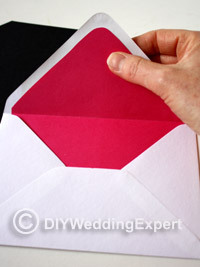 Place your colored paper inside your envelope. Line it up so that it sits in the centre. 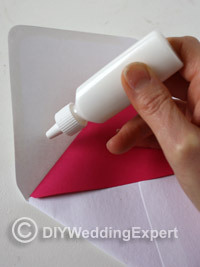 Add a line of glue just below the glue seal of the envelope. Line it up carefully and press it into position. 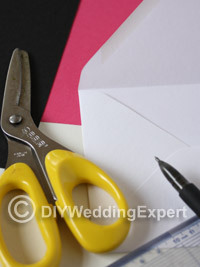 For this example I’ve used plain paper but you could add more decorative papers and motifs to coordinate with your own personal DIY wedding invitation.